Lately, I’ve been doing chess puzzles. They are varied and challenging, and vast numbers are available for free online and as mobile phone applications. A great way to kill time in doctors’ waiting rooms, where a whole chess game is entirely too complicated, too long, and too much of a headache. (This is true outside of doctors’ waiting rooms as well.) Puzzles focus on the endgame, or a single tactical situation. A more limited commitment, appropriate to our times. Most of us first encounter the kind of chess problem that requires forcing a checkmate in a fixed number of moves. 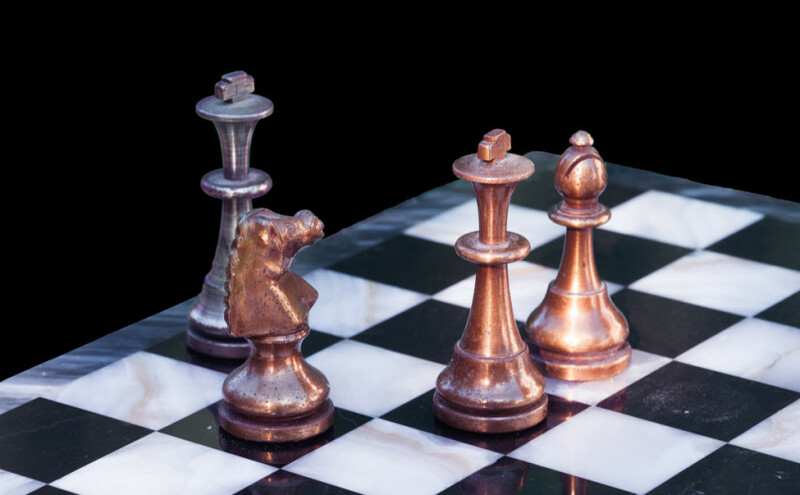 Other problems ask for the best move in a non-mating situation, perhaps resulting in the gain of a piece, or in securing a draw. These add another dimension in that the objective must first be identified, and then the enabling tactics devised. 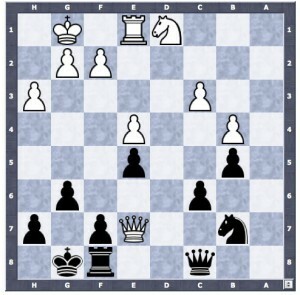 Ideally, the opponent’s moves are forced, and the solutions are unique. There are also specialized puzzles with different rules, and puzzles played on boards with fewer squares, for example a 4×4 matrix. But I stick to the ones played on a normal board under the usual rules of chess. Today, there are so many of these puzzles that you wonder where they come from. And they keep coming, in an endless stream, conveying a sense of infinity from permutations on an 8×8 board. There are basically two puzzle sources: humans and computers. A great many of mating problems have been culled from the recorded history of chess, of course. This vast trove of games has been inducted into big data following contemporary custom. And this, in turn, has led to “teaching” various pieces of software to play, so that now many chess puzzles are simply computer-generated. And their number seems limitless. I find it interesting that the programs must come up with the opening positions as well as the solutions. That is, they must find positions which match certain puzzle-able criteria, and I wonder what those might be, for the tactical problems in particular. Many of the outfits that do this are are Russian, featuring complicated websites with languid servers and accented English. (Mental image of unwashed Russian computer chess nerds in bare offices with several games in progress.) The computer-plus-chess obsession has to be worse than computers-plus-baseball. These websites all have their own computer chess engines, and you can buy a membership to play against them, or to access lessons. They offer exotic things called taxonomies and Lomonosov tablebases along with their software. I have no idea what tablebases are, but I looked up Mikhail Lomonosov on Wikipedia, where I learned he was a Russian polymath. (I did not have the enterprise to look up polymath.) Some of the websites sell t-shirts, too. Geek chic. I can’t decide if I want one. The diagrams below are stolen from ChessOK, one of my favorites. It is possible to find errors, or at least non-unique solutions, in the computer-generated puzzles on most sites. The people at ChessOK told me that they have real people who check the puzzles for correctness, but that they will publish a puzzle even if it has alternative solutions. I think that’s what they told me. 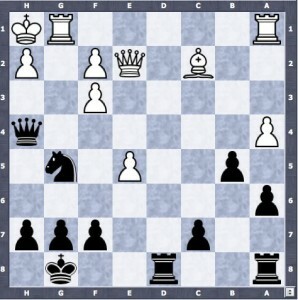 On the first board, for example, you’re supposed to find the best move for black. This turns out to be trapping the over-adventurous white queen by moving up the bishop pawn, 1..f6. The computer responds with 2. Re3 and demands another move from black. It will only be satisfied with 2..Rf7, which puts the screws to the queen. But why not 2..Re8? This also takes out the queen. Yet if you make this move, program rejects it. This type of thing can be a little frustrating but still, it gets you engaged in the analysis. In a doctor’s office, it’s better than sudoku. A more egregious failure of the algorithm occurs when the so-called correct move is one that is met by a conveniently naive response. For example, to find the best move for black in the situation shown here, 1..Rd2 is the given solution, and it gains a bishop if it is followed by 2. Rg4 Rxe2; 3. Rxh4 Rxc2. But what if white plays 2. Qxd2? Then you lose a whole rook. Is there any reason why white should not do this? After an hour trying to find a solution, this sort of thing can leave you huffing. Still more frustrating, there is no way to follow it up, to ask if this puzzle is not, how we say in English, fucked up. For the puzzles are ephemeral, without serial number or other means of reference. You click a button, a new one appears. Click again and it is gone forever, just one in an endless stream of puzzles, right or wrong.